Overwatch |OT2| Live Long and Alla Till Mig! Looks cool, but "Stealth Bastion" is the ultimate evil Bastion skin. I agree with this tho. Horsey needs more love. Will there ever be an interesting Bastion skin? His design doesn't lend itself to anything interesting. Maybe a robot pirate who turns into an old cannon? The bird could be a parrot. LEGO would be nice. Honestly the art team that designs skin for events aren’t good at it imo. these healers need to heal the carry. especially the one with the shield and pew combo. I love how often that happens. Hanzo and Soldier spend the first round getting dominated by a Pharah and then instalock Reaper and Junkrat for the 2nd round. That Zarya Epic recolor... why?? My god, except for Moira everything about Archives revealed so far is so boring. I really wonder what are they doing. It's like they are not even trying. Question: I started a new account on PS4, I'm still grinding to level 25 so I can play Competitive. But I was wondering does my performance in quickPlay affect my starting/placement rank in competitive when it's a brand new account? As a healer main I know the pain of a Pharah doing uncontested damage to your team. But in my experience I found the best counter to Pharah is with a Sombra, since Pharah players tend to panic when they're grounded with no mobility. Yes, your quickplay performance is used to establish an initial baseline for competitive. feeling underappreciated. as a support player willingly to play solo tank (Orisa/dva) because we got 3 dps instalocks, a zen and some other support, who initiated the whole lets not be toxic and have 3 dps, ends up not healing the team when the zen held gold healing until the end of the game going into 5-4 (Horizon). i was fine with the 3dps actually. they killed things. its the dying as your only shield on point. zen tried best. User Banned (1 Day): Inappropriate language + Inflammatory generalisations. It's been a good year or so since I've played a lot and among the things I'm noticing is yeah, a lot of Moira's seem to play DPS first and then heal only when there's nothing else to do. If I'm on a team and the Moira is the only healer, I play like we have no healer. It's been a good year or so since I've played a lot and among the things I'm noticing is yeah, a lot of Moira's seem to play DPS first and then heal only when there's nothing else to do. In my experience most will decide to heal after the enemy team is dead, but during the fights most Moiras never use healing orb or normal heal ability. I'd like to see her main attack not self heal her. I'm sure that made sense in your head. Whenever I play as her, I swear people forget that she is a short range healer who cannot heal through shields. Teammates playing footsie with the enemies Winston shield while he kills me is annoying when I try to follow them into the front line. Pretty sure data west is talking about the legion of D.Va fans who go mental in the responses on the OW Twitter each time a skin revealed isn't D.Va. Or the B.net forums. Either way the comment isn't... unwarranted. "Stop standing in the choke & push"
Ah okay thanks, time to put on my tryHard hat lol. Is this actually true though? I've seen a lot of people say that, but from personal experience and from even high level streamers on new accounts, the first placement game always seems to be somewhere in gold. Unless those high level players are just buying accounts that have already been leveled up. Mainly looking at Kabaji, he's now done 3 of his unranked to GM accounts and all three the first placement game was somewhere in gold. I can't imagine if he leveled up an account in QP it would make him start there. For an epic skin, I actually don't think this is too bad. The blue of her uniform looks too similar to her default, but Zarya's hair looks pretty good here. But this means I was wrong. 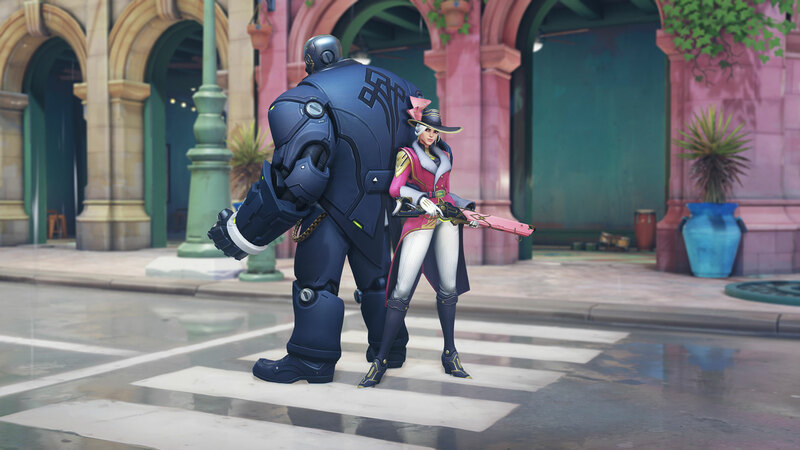 No Overwatch Winston skin is forthcoming after all, since we know the final skin is Ashe and Bob. Honestly, I was expecting a tracer skin atleast, but apparently not. Daily reminder that Genji needs a buff. I think Genji will return as soon as Role Queue makes Goats impossible. Like I said before, I just wish they weren't using 75% characters that they already used in other events. But I guess it doesn't really matter so long as they give you a mode where you can pick whatever hero you want. Just a shame other ow don't get the starring roles. I am so sick of Tracer and Soldier. Just phase them out from the main storyline. Give me more lore on Genji/Hanzo and Lucio/Symmetra. I love it whenever Genji calls Mercy, "Angela". Makes me giddy lol! Also, would love some talon development starring Doomfist. So wait, is this taking place in the present day? Like post-recall? I wish Moira could just heal consistently without having to do damage to recharge her healing. Soldier just ruins everything, doesn't he? QP performance probably matters a little bit. My first ever placement a few months ago was in low diamonds. It's called archives. That sound new? I see this excuse from DPS Moiras, but they don't need recharge until they've actually healed, and healing orb is a better method of healing than trying to DPS and healing after, but no they won't be using that. Watching my friend who's new to overwatch attempt to take on the whole team solo as Pharah. Nice skin, but not what i was expecting. That young/long hair version from her Origins video would have been so much better. I mean event is called "Archives". Blizzard wyd? ?